Parents we have to remind ourselves that Jesus is the only one who redeems. Does that mean you are off the hook? By no means. We water we plant God makes plants grow. We are called as parents and pastors in the life of a child to water and plant but the Lord Jesus Christ is the only Redeemer. My challenge to parents is threefold. Don’t waste your devotion is a simple challenge to parents to live their faith in the light of day. We live in an age of specialization and privatization that has spread into our homes and into our faith. We leave public faith to the “religion specialists” at church and we privatize our faith at home to such an extent our kids never see us read our bible on accident or on purpose. 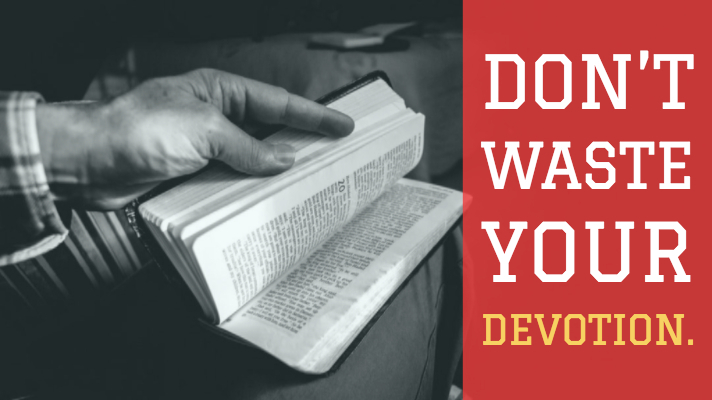 Don’t waste your devotion is a call to public “Personal” prayer and Bible times. Rather than secluded closets and locked bedrooms. Let your kids see you read the bible in the morning and pray payers not so they can think you are something that you are not but that you can model a devoted life. I read my Bible and pray across the table from my kids eating frosted mini-wheats. I don’t do this so my kids think I am holy but rather so they can see where I place my trust every morning. A devoted life isn’t just public devotions but conversations that point kids back to Christ as our greatest treasure. A devoted life is them seeing you lead someone else closer to Christ as you disciple another believer one-on-one or in a small group. A devoted life is one where you mention your concern and demonstrate it by praying for world missions. Recently a missionary we support asked for Bibles we discussed this as a family bought the Bibles and prayed over the Bibles as a family. Because I want my kids to see needs of others and to see their need for others that are part of the worldwide body of Christ. We don’t waste our devotion when we do what the gospel requires of us in front of our kids rather than behind their backs because what many would consider flaunting our faith when it comes to our kids it’s called discipleship. Parents don’t waste your devotion.